The Apollo mission is always held as a great point in American history. But imagine this…if Spain had reached the new world and decided that getting there was enough and came home, never colonizing the land, would we see that today as a victory? America gave up. Vietnam became more important than the Moon. Defeating Communism, a flawed idea, was the rule of the day. Showing everyone on Earth that Capitalism was a better system became the citadel of the time. But our technology, dreams, and prosperity beckons. It is in the American’s DNA to discover, to question, and to move beyond what we are. That is how we came to be….what we are. Mars, Venus, the Moon…these are are our new Western Frontiers. Lewis and Clark channel these thoughts. Getting to Mars is a technical, logistical, and psychological challenge. While getting to the Moon may have required no more motivation than nationalism and being able to say “we did it”, Mars will require a more permanent and lasting mechanism. Europeans bumped into the Americas upon their quest for a quicker trade route with the East Indies. Their motivation for doing this had almost nothing to do with nationalism, discovery, or any social ideal. Their motivations were mostly base and selfish. They were seeking profit, power, and gain. They were capitalists and imperialists. Upon finding this “new world” they proceeded to colonize and plunder it. In a parallel to history, I propose that we need to discard our Cold War socialistic behavior of space exploration as an endeavor for the common good and rewrite our destiny bent around the imperialist and capitalist traditions that made Australia, The United States, Canada, Brazil and Argentina what they are today. An interstellar imperialist view is required for us to truly conquer the heavens. This deck covers my view. Called Tyr, I launched an IndieGoGo campaign to get it moving. Contribute if you can. So what’s the difference with Tyr’s approach? How is Interstellar Imperialism different from Cold War Socialist Space Exploration? Individual liberty and profit vs collective ownership and control of space assets. Space as a place to be conquered and owned vs explored and studied. Permanent colonization vs brief visits. To transform alien worlds vs accepting them as they are. Humans as the dominant life in the universe vs hoping someone else is out there. Interstellar imperialism vaults humanity into control of this vast and empty place; pushing our will upon this canvas. Rather than funnel humanity’s interstellar ambitions through select governments and billionaires we should seek technologies and mechanisms that lever us toward conquest. 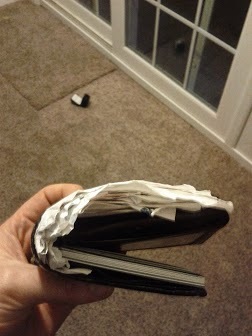 I keep all my receipts and at certain points in the month I can no longer sit flat on a chair. I’m moving to Google Wallet. Please no Seinfeld jokes. My most recent news item covers the latest scrum extensions and asks a few questions about the purpose and future direction for scrum extensions.